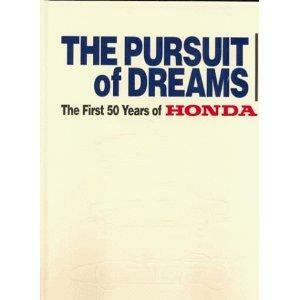 by: Hideo Otani - Excerpts from "The Pursuit of Dreams"
Honda has always been a maverick company. When Soichiro Honda decided to move up from motorcycles to cars, he did it his way: with a string of super little open two-seat sports cars that were simply brimming with technical innovation and were so neat to look at and to drive. The first of these was the S500 and the date was October 1963. Nobody really knows when Soichiro Honda first decided to build cars. It might have been around 1958 when Yoshio Nakamura who was later to become project leader for the Honda Sports series and highly respected manager of Honda's first F1 team joined the company. In early 1959, the study group came up with its first prototype called X170. Power came from a remarkable unit, truly worthy of Honda at its most inventive: a 360 cc air-cooled V4 with overhead cam, the engine mounted longways on the front of a basic platform chassis covered with only rudimentary bonnet and soft top. No body panels. At the ninth Tokyo Motor Shop in October 1962, the Honda S360 made its official debut. At the show, a scarlet coloured S500 was on display along with a metallic silver S360. Honda had already realised the 360 cc engine lacked power and had built up a bigger 492 cc version with bore/stroke ratio of 52/58 mm. The S500 finally went on sale just after the 10th Tokyo Motor Show. The S360 was quietly dropped. The production version of the Honda Sports was much improved. It was 135 mm wider and had a larger 531 cc engine (54 x 58 mm) than the final prototype. To understand just what a sensation the Honda Sports was, we need to do some cross-examination of the Japanese car industry of the time. In those days, most cars had a iron block ovh engine and usually just one carburettor. If there were two carburettors, it became a "sports model". Alongside these engines, the Honda was almost from another planet. With all the hi-tech complexity in such a tiny body, the S500 deserved to be called a "small giant". Yet it was its beautiful body style that also captivated so many people. Even today, the Honda Sports hasn't lost its looks. Heavily influenced by lightweight British sports cars of the day, the S500 was the embodiment of Soichiro Honda's bold intentions. He visited the design department every second day to insist the car evolved exactly the way he envisaged it. Although the S500 with its heavy 725 kg body had a top speed of 130 km/h, it still wasn't over-endowed with power. Well aware of this, Honda acted quickly to expand capacity to 606 cc (54.5 x 56 mm) and this new S600 then went on sale just three months after the S500 had appeared! Yet even as the S600 bowed in, Honda R&D was already hard at work on an even more powerful edition. this was to be the S800. As for the S800, it had a maximum of over 160 km/h, thus proving it was a "great 100 mile per hour car", as Honda used to say in its adverts. Then, in May 1966, only four months after going on sale, the S800 went through a fairly major change. Honda replaced its aluminum chain-case independent rear suspension with a simpler rigid axle secured by four links and Panhard rod. The last of these peppy Honda Sports was the S800M. Launched in Febuary 1968, it was a more refined and luxurious upgrade of the S800. While power stayed the same at 70 ps, the S800M came equipped with things like factory auto-seek radio and big capacity heater. When the last S800M rolled off the line in May 1970, it brought production of the whole series to nearly 25,000 cars. At that point, Honda stopped production of the Honda Sports. An era was over. by: Shotaro Kobayashi - Excerpts from "The Pursuit of Dreams"
"The performance of the Honda S600 is above that of a 1.0-litre sports car. This, together with reasonable accomodation with superb weather protection, tough suspendsion and an unexpectedly flexible engine makes the Honda S600 an altogether highly practical proposition and a wonderful buy at 509,000 Yen. The reliability and durability of its complex engine couldn't be assumed in this short test but time will tell us later, " I wrote. For today's young generation, it may be impossible to visualise how enourmous the impact when Honda unveiled the S500/S600 in 1964. When the rev limit of a top European sports car was less than 6000 rpm, Honda's jewel-like dohc engine was happy to be revved to 10,000 rpm or even more. Then, one night in bed, I came up with what I thought was a great idea. Why not buy a Honda S600, ship it to Europe and follow the Honda F1 challenge over its first two or three races. then report back for Car Graphic, thus deftly scooping all other Japanese medias? The following morning, I decided to turn this idea into a reality. From July to September 1964, my wife and I toured across Europe for 12,000 kms in our S600, starting from London and driving out to many parts on the Continent. As I was financing the trip myself, this meant it was a mixture of private holidays and business. The three Grand Prix races we went to, the British at Brands Hatch, the German at the Nurburgring and Italian at Monza, were the highlights of our trip. I can still clearly remember the scene at the 'Ring when the white-bodied Honda RA 271 with the big red rising sun painted on top, was pushed slowly up to the starting grid by Yoshio Nakaumura, the team manager, and his mechanics. For the first time in my life, I felt proud to be Japanese. The real joy of this trip was the fact we were free to travel anywhere and do anything we liked. We scarcely visited tourist spots. We were young and optimistic so didn't worry about a thing. It was Honda people, however, who were worried: about us touring Europe in its new-born baby sports car. I heard later that Honda sent over an ivory-coloured S600, exactly the same as mine, as a back-up car, just in case. It was during the test-drive session for the Honda S500 that I first had a chance to meet and have a friendly chat with Soichiro Honda. The date was August 1963. 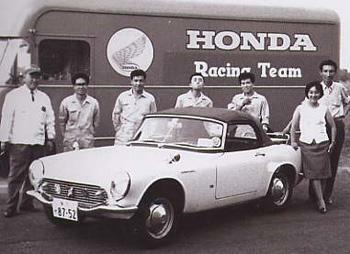 We were to drive the S500, scheduled to debut later that year, at Honda's Arakawa test course. The Arakawa test course was very primitive. Made on the dry Arakawa river bed, its two straight lines were connected by a slight kink. The test course was surrounded by a simple fence so it was all clearly visible to anyone on the river bank. Soichiro Honda, whom I met for the first time during the test drive session, hardly looked like the head of a top Japanese corporation. I remember he walked up to us wearing the same white working suit that his engineers wore, and a red cap. Then he surprised every journalist present by driving and testing the S500 himself with some verve at the circuit. To this day, I have never seen any other executive from a top Japanese carmaker driving his new car in front of media people. Except Honda, that is. Soichiro Honda was cracking jokes all the time but also replied politely in his own words to the sometimes amateurish questions put to him by journalists. Thereafter, he never changed his style throughout all the years of our long friendship. 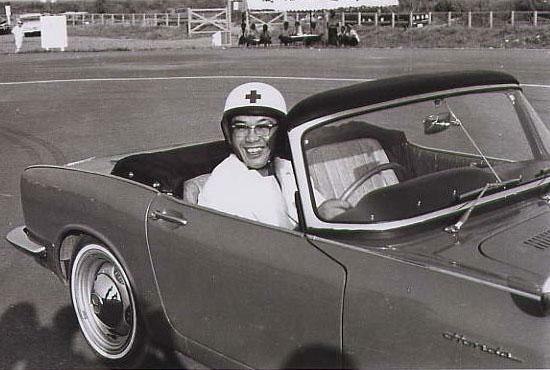 Soichiro Honda was an extraordinary man: both an imaginative dreamer and a down to earth engineer. A colourful non-conformist, he could sometimes be stubborn but was always humane and considerate. The eldest son of a blacksmith, Soichiro was born at Komyo, near Hamamatsu, on November 17 1906. His interest in all forms of machinery was kindled at his father's small workshop where Soichiro helped with bicycle repairs. At the age of eight he first sighted a car that fired his imagination, then, and as a young man he built a series of racing cars, being lucky to escape serious injury when he crashed one spectacularly in 1936. In the following year, Soichiro set up a piston ring factory, responding to technical snags he encountered by studying metallurgy. 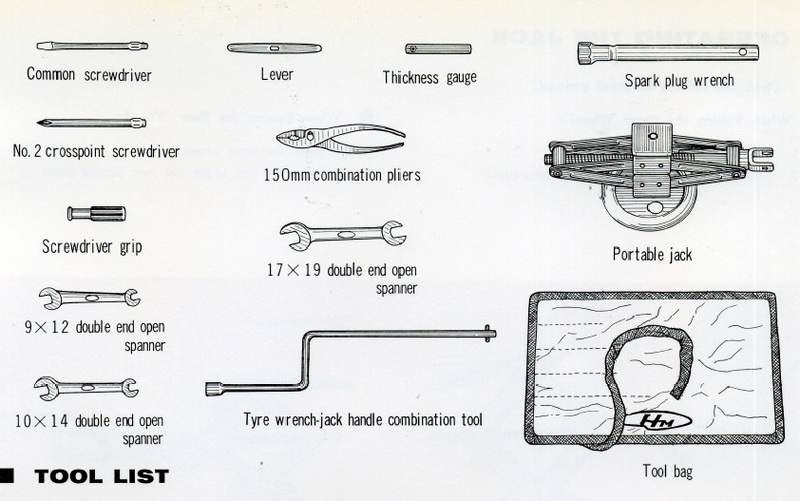 In 1946 he set up the Honda Technical Research Institute, which despite its grand name was only a wooden hut. Seeing a desperate need for basic transport all around him in war-scarred Japan, he hit on a scheme. Buying a batch of 500 surplus engines designed to power military radio sets, Soichiro gathered a team to help him attach them to pedal cycles. Honda's own-made products duly followed and the Honda Motor Co. was established in 1948. During the 1950s, its founder's creative genius propagated a stream of innovative designs making Honda the world leader in motorcycle engineering within an amazingly short time. Awed by the Isle of Man TT when he first visited Europe in 1954, Soichiro made racing success a goal, knowing it could greatly benefit Honda. Affectionately known to his work force as 'Oyaji' ('Dad'), Honda inspired people to use their imagination and give their best. He was willing to put trust in young people and give full rein to their creativity. Believing that people should advance on merit and not through nepotism, Mr. Honda refused to put relatives in senior posts, and when he retired in 1973 he put the company in the capable hands of Kiyoshi Kawashima. He and his wife Sachi both held private pilot's licences, he was still skiing, hang-gliding and ballooning at 77, and he was a highly accomplished artist. And he was a man of rare understanding. He had never wanted to follow his father in the smithy or the bicycle shop, and he and Fujisawa made a pact never to force their own sons to join the company. Soichiro actually barred his family from senior positions, insisting that the presidency should be gained on the basis of merit, passed "to a person possessing the most distinguished qualities of leadership." Soichiro then devoted himself to the Honda Foundation, seeking harmony between technology and the environment. Having fulfilled countless dreams over half a century, he died in August 1991 leaving his wife, a son and two daughters.